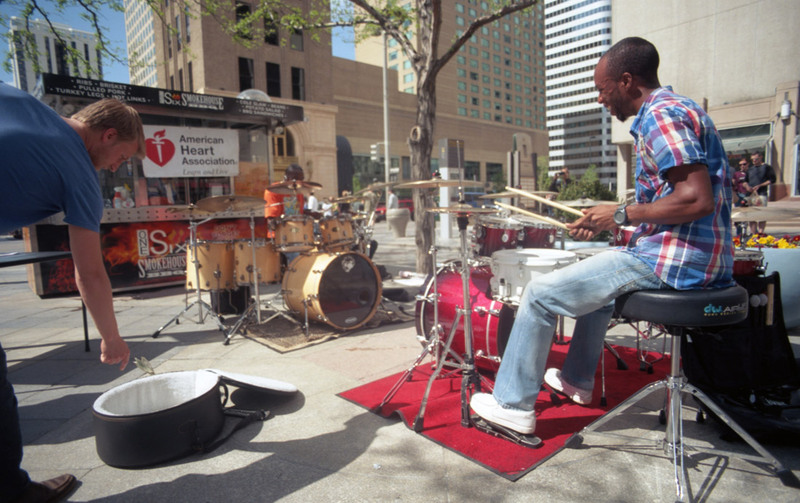 On May 18, 2013, I caught Laban Ford and Lem Williams as they put on a drum-off exhibition to raise money for the American Heart Association on Denver’s 16th Street Mall. 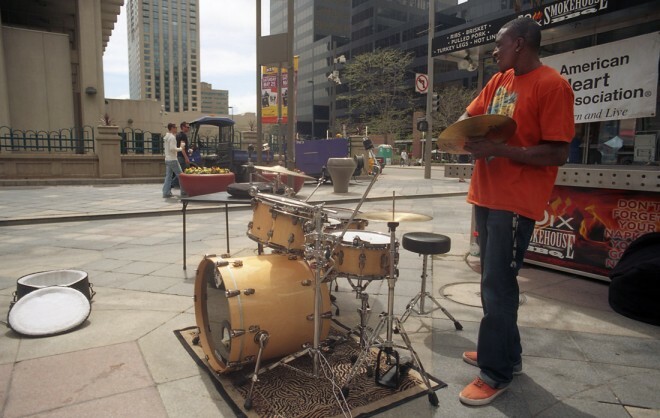 I was taking a lunch break and walking down the Mall on a Saturday afternoon when I noticed Ford setting up his drum kit in the center walkway up near Skyline Park, so I stopped to ask what was going on. 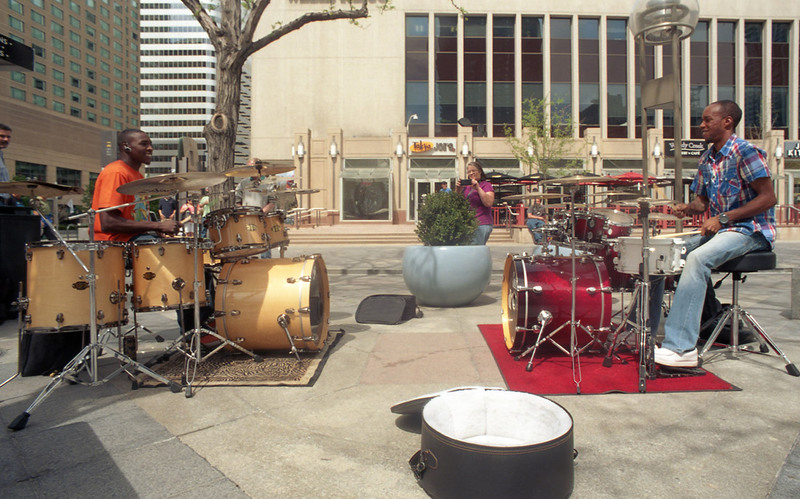 They were lugging their drums from parked cars over a block away and carefully assembling and arranging every individual piece of each drum set. Once every cymbal and tom tom was arranged just perfectly, the tension on the bass drum and hi-hat pedals adjusted perfectly, and a couple empty drum cases arranged for donations, they launched into a powerful joint beat that built steadily to a nearly deafening roar of synchronization and syncopation. 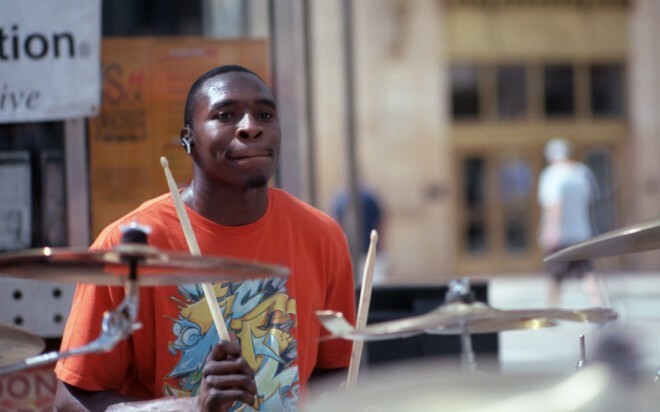 Ford and Williams, friends since childhood, both took up drumming at a very early age. They turned their shard passions into careers as gigging band members, playing gigs with churches and community centers, working with underprivileged youth and organizing fundraising exhibitions. 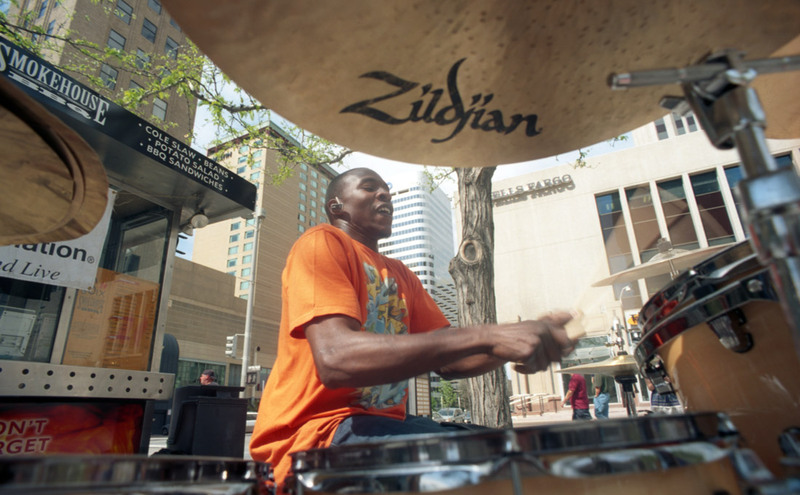 Williams is currently a member of Denver band Robby Schechter & The Motion Detectors. Once their kits were set up the two said a short prayer before they began playing. 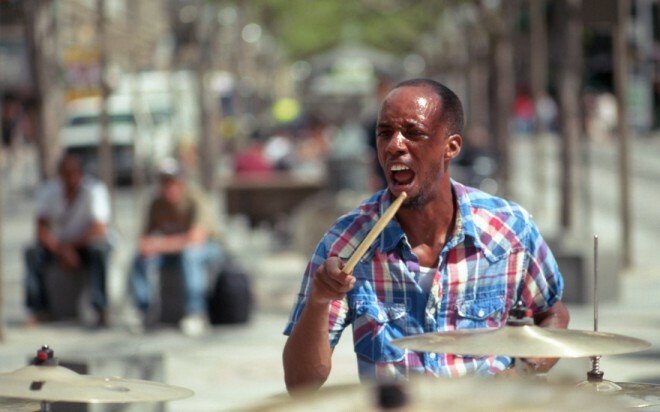 “God to give God glory first,” Ford said as he picked up his sticks. Just as they were really finding their groove in the beginning of their set, two Denver Police officers on motorcycles arrived and motioned them over. 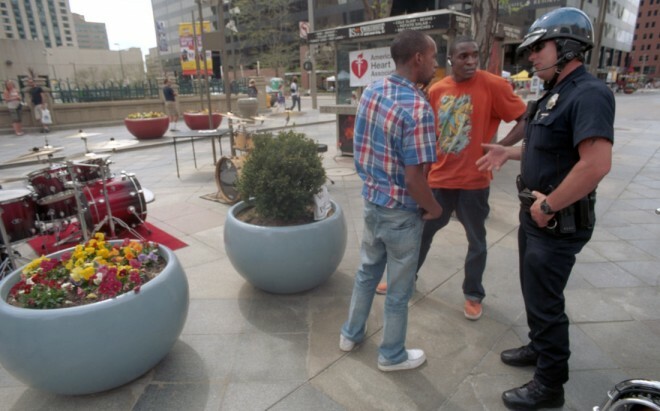 It was apparent that Williams and Ford had a previous relationship with one of the police officers, who warned them that while he had no problem with their being on the Mall, he knew of a tenant in a nearby condominium building who habitually called in noise complaints for loud performances on 16th Street. 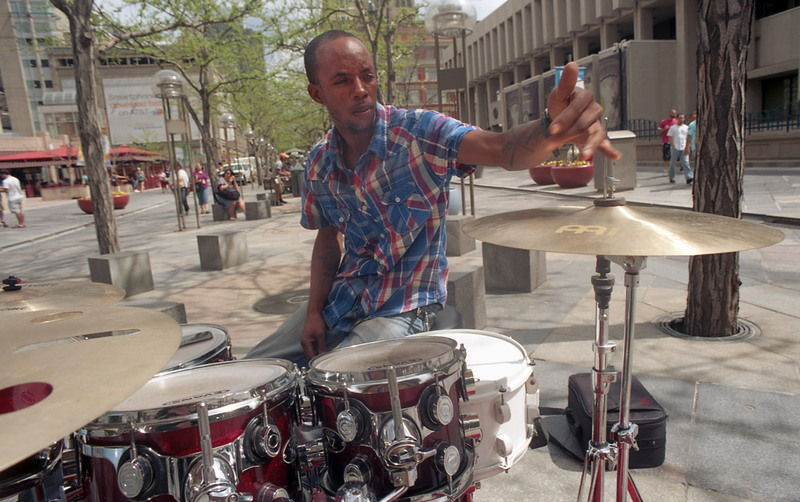 After discussing that he might be forced to issue a citation if the call were made, the officer told the drummers that he was as much on their side as he could be. They discussed the likelihood of problems for a moment before deciding to press on with the show for an hour or so and take their chances so they could raise at least a little money before leaving. 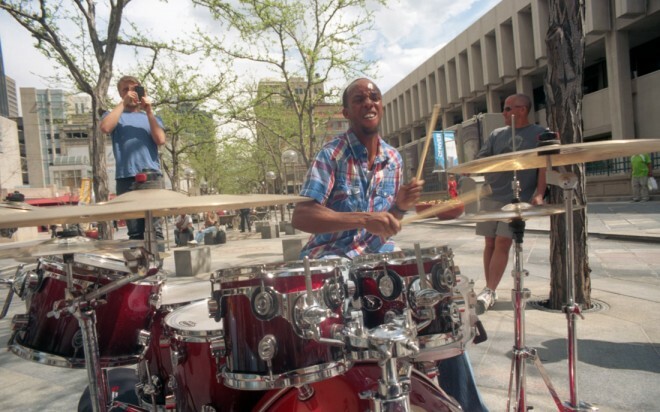 They launched into a twenty-minute rhythm, trading fours back and forth and somehow managing to crescendo beyond forte fortissimo as the crowd around them swelled from dozens to at least a hundred people, many keeping a little distance as the volume grew. Interested in seeing the show live? They apparently play a couple times a month in about the same spot. 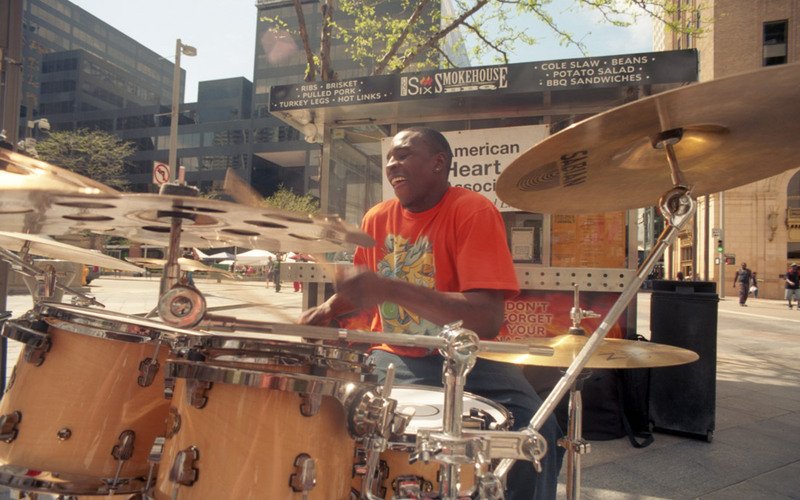 An impressive performance from March, 2012, found its way onto YouTube and Williams also has his own channel on the site. 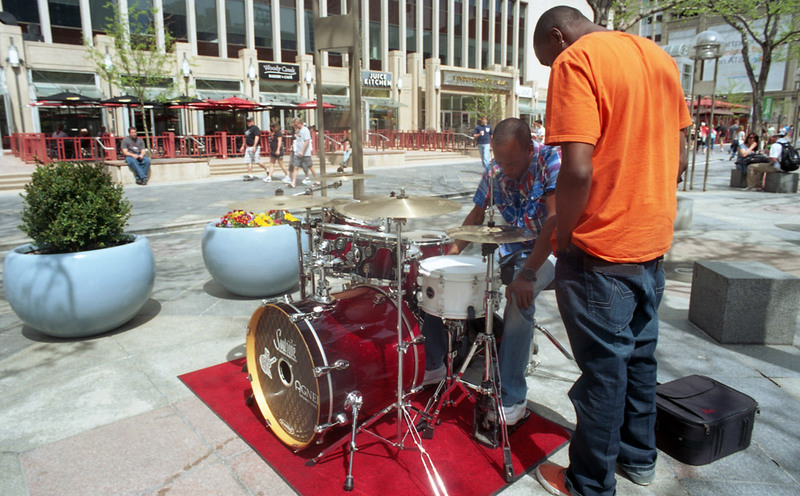 After just one complete number, there were at least $50 in small bills in the drum cases around Williams’ and Ford’s kits. I shook their hands and wished them luck as I left with just a few minutes left to grab a bite to eat on the way back to the newsroom. All these photos were made with my Nikon FM2n using Kodak Professional Ektar 100 color negative film, developed by Englewood Camera. Nearly all were made with a 20mm f/4.0 lens; the second- and third-from-last were made with a 105mm f/2.5. Scanned on my Epson Perfection v600. As always, Photoshopping is limited to dust removal, minor dodging and burning, and slight exposure correction.